I had a hard time taking this book in. I enjoyed it, but it was pretty heavy stuff. It’s unusual because I’ve read so many books on heavy stuff lately: Wintergirls, Crank & Glass, Split. But nothing is quite as heavy as suicide. This book takes a very blunt look at suicide and how someone can be driven to end their life. It forces the reader to look at their life and evaluate how their actions effect others. Clay, one of two main characters, is a nice, straight-laced boy. But when he listens to Hannah’s tapes, he’s forced to face some things that have been swimming in the back of his mind since he first heard of Hannah’s death. Hannah, the other main character, explains on her tapes the snowball effect that brought her life to an end. She holds the people involved in her pain accountable for what they’ve done. This book focuses more on plot and theme than character development. Yes, we see Hannah decent into sadness and depression, but I felt that was more because it was an important part of the plot than it was development. The theme of thinking before you act, and recognizing your effect on others is an important one, not just for teens, but for everyone. Like Hannah says, you never know what someone is going through. There are hundreds of people out there who need help, but don’t know how to ask. Or people crying for help, but no one listens. 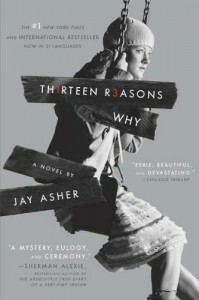 Hannah’s tapes make a difference in Clay’s life, just like I think this book can make a difference in other’s lives. I’m really glad I decided to listen to the audiobooks because the effect was really awesome since Clay’s supposed to be listening to tapes of Hannah telling her story. The narrating was great. I strongly recommend listening to the audiobook version.